It is the most gut-wrenching fear of every parent - to lose your child. On Christmas Eve 1945, George and Jennie Sodder had this fear come true not just once, but for five of their ten children. 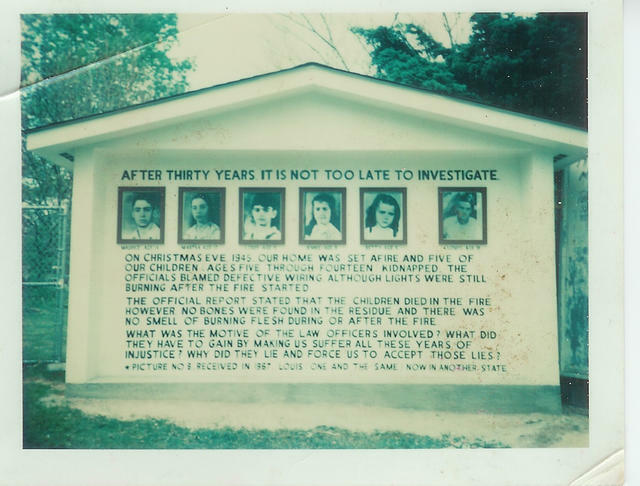 A fire erupted in their Fayetteville, West Virginia home and their five children who slept upstairs, Maurice, Martha, Louis, Jennie, and Betty were not able to escape the fire. Sadly, this story gets stranger and creepier. Sometime before the fire broke out, the Sodder family was visited by two odd men posing as insurance salesmen on their doorstep. Allegedly, one of the men told George (an Italian immigrant) that he would pay for the negative remarks about Mussolini that he had been making around town. These strange men made very specific threats about their house burning down and their chidlren dying, and I quote, "Your goddamn house is going up in smoke and your children are going to be destroyed. You are going to be paid for the dirty remarks you are making about Mussolini." EVEN STRANGER - this exact same 'insurance salesman' served on the coronor's jury that demeed the fire an accident. The more I read about this case, the more my mind is blown to tiny pieces. There were several eyewitnesses that came forward saying they saw the insurance salesman around the Sodder house carrying a block and tackle, which could've been used to disable George's car. They also found a strange plastic object in the Sodder yard, which George claimed could've been a Napalm bomb. So is this truly a case of a mysterious disappearance, an intricately planned attack, an accident gone wrong? 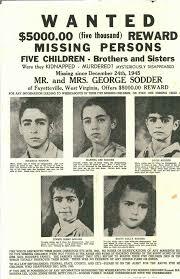 In any case, what happened to the bodies of the five Sodder children? After some time had passed since the fire, a waitress at a roadside diner and a woman in a hotel in Charleston claimed to have seen four of the five missing children sitting at a table surrounded by Italian-looking men and women who would not let them speak. Jennie Sodder also received a mysterious photograph in the mail 20 years after the fire of a man alleged to be her son. The letter was postmarked from Kentucky but had no return address. On the back of the photograph was written, "Louis Sodder. I love brother Frankie. Ilil Boys. A90132 or 35." George and Jennie hired a private detective and sent him to Kentucky to investigate. They never heard from him again. 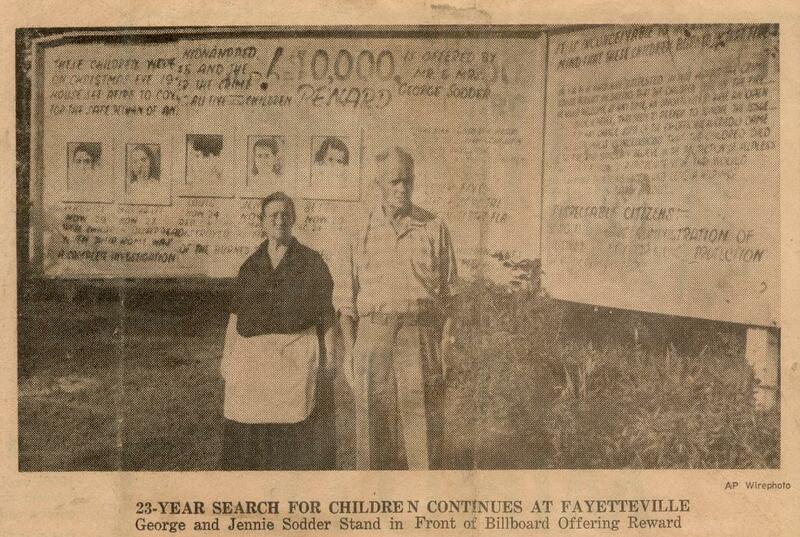 George and Jennie erected a large billboard, seen below, that was amended over the years and remained standing for over 40 years. George died in 1968, sending Jennie into a further spiral of depression. She erected a fence around their property and began adding more and more rooms to their house, building layer and layer between her and the outside world. Jennie wore black clothing exclusively since the fire and continued to do so until her own death in 1989. Upon Jennie's death, the billboard came down. 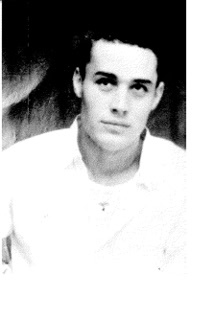 Sylvia is the youngest and last surviving Sodder child. At the age of 71, she still pores crime sleuthing websites and engages with those still interested in her family's mystery. Sylvia doesn't believe her siblings perished in the fire of 1945. Her first memories are of the fire at two years old and she has spent her life asking so many questions and getting very few answers.